Liwa'a 313 claims responsibility for Tuesday's attack on Hizbullah stronghold. The Liwa'a 313 Brigade, a faction of the rebel Free Syrian Army (FSA), has claimed responsibility for a bomb attack which rocked the Bir al-Abed area of Beirut's Dahiyeh suburb, a stronghold of the Hizbullah terrorist group. In an Arabic statement issued on Facebook Tuesday, the group lashed out at the Lebanese state, which it said actively assists Hizbullah. It claimed the bombing was a response to Hizbullah participation in the Syrian regime's ongoing offensive against the city of Homs - a strategically important position and a hub of rebel activity. Scores were reported injured in today's attack, but precise details - including casualty figures - were hard to come by, as Hizbullah operatives immediately cordoned off the area and blocked journalists from approaching. A video aired by Hizbullah's own Al Manar TV shows the scene nearby the blast in its immediate aftermath. 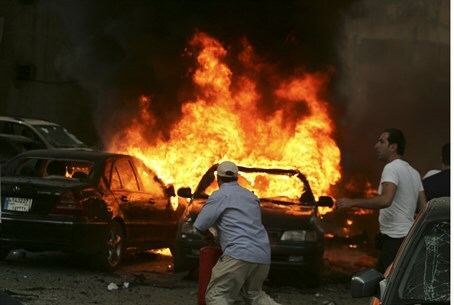 Liwa'a 313 also claimed responsibility for an earlier bomb attack in the Bekaa Valley. The claim of responsibility is likely to up the ante in the escalating battle between Sunni rebels in Syria and the Lebanese-based Hizbullah, a Shia organization backed by Iran and the Syrian government. It will do little to calm fears that the Syrian civil war is quickly spilling over into Lebanon, a country whose patchwork of sectarian religious and ethnic communities is only tenuously held together at the best of times. Hizbullah fighters have been battling alongside the Syrian army and pro-government militias to crush the Sunni-majority rebels, and the Iranian-backed group's participation was deemed crucial in the Assad regime's fight to retake the Quseir region, on the Lebanese border. Syrian rebels have long warned Hizbullah of retaliatory attacks for its intervention in the Syrian conflict. In May, only hours after Hizbullah leader Hassan Nasrallah first admitted his organisation's direct role in fighting Syrian rebel two rockets were fired into a Hizbullah-controlled suburb of Beirut, injuring four people. But if the statement of responsibility is genuine, today's attack in Beirut would be the largest yet on Lebanese soil by a Syrian rebel group, and could foreshadow an even bloodier escalation in a conflict that has already claimed at least 100,000 lives.